Tohoku Agricultural Research Center (TARC) aims to promote technological development for the advancements in agriculture and food industry taking full advantage of the abundant natural resources of the Tohoku region, constituting the northern portion of Honshu, the largest island of Japan. The center promotes research and technological innovations focusing on the establishment of highly productive paddy field farming, coping with and utilizing cold climate, enforcing the circulatory functions of the agriculture and livestock industries, and enhancing health functionality and attaining safety and security. A study by researchers at NARO with 18 organizations in nine countries found that multiple crop simulatiom models provide reliable estimates of rice yield in higher CO2 levels in the atmosphere. 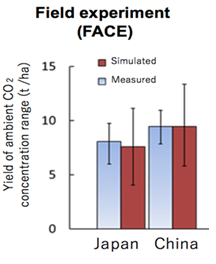 The study tested 16 rice simulation models against the observed yield under elevated CO2 concentration. The yield prediction response varied significantly among the different models, but the averaged predictions agreed well with the observations suggesting that the effect on rice yield can be accurately predicted using multiple prediction models. The improvement of yield prediction will be an important basis for developing countermeasures against climate change. Read more. The 2017 Organic Farming Innovation Award (OFIA) Science Prize was awarded to Dr. Hiroshi Uchino, Senior Researcher of the Forage Production Group, Division of Livestock and Forage Research, TARC/NARO. 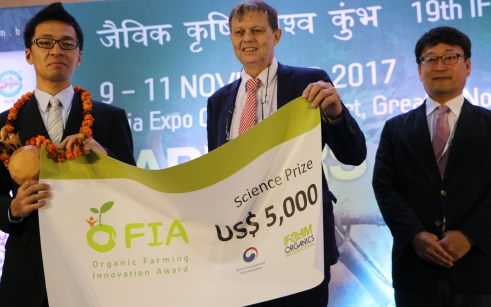 The OFIA is given by IFOAM-Organics International to recognize scientists, extension agents and practitioners engaged in organic innovations around the world. The awarding ceremony was held on November 10, 2017 in conjunction with the 19th Organic World Congress in New Delhi, India. Read more. The hexaploid nature of wheat has been effectively used to create variability in starch characteristics. The Tohoku Agricultural Research Center in collaboration with Nippon Flour Mills Company, Ltd. and Canada's Bioriginal Food & Science Corporation has identified the differences among wheat genotypes in terms of many starch characteristics, including percent amylose, chain length, distribution, gelatinization temperature, retro-gradation, and pasting properties. These differences appeared to translate into improvements in end-product quality which should be useful for bakery products. Bread staling represents an important source of food wastage, and the lines characterized here showed reduced starch retro-gradation which is thought to be a major cause of staling. Incorporation of these genes in commercial wheat varieties via marker-assisted selection-based breeding has been initiated in both Japan and Canada. Read more.